The OneDrive app lets you upload your pictures and download any files you have at OneDrive.com. Note: The OneDrive app does not sync files automatically, but you can upload updated files and edited pictures. After you download the OneDrive app, watch the video for quick tips or expand the sections below to learn how to use it. To add a personal account, enter your Microsoft account on the sign in page. To add a OneDrive for Business account, enter the email address you use for your company, school, or other organization. 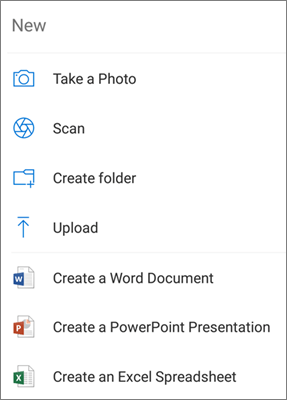 To add an additional OneDrive for Business account, tap your picture or the icon at the top of the app , and then tap Add account. Sign in using the username and password you use for OneDrive for Business. To switch between a personal OneDrive account and a OneDrive for Business account, or between multiple OneDrive for Business accounts, tap your picture or the icon at the top of the app , and then tap the account you want to use. Tip: You can add only one personal account to the OneDrive app. To open a different personal account, open Settings, tap your account name, tap Sign out, and then sign in with the account you want to use. Upload files to OneDrive, such as documents, OneNote notebooks, photos, videos, or music, with the Upload tool. Tip: If your device is set to automatically upload pictures to OneDrive, pictures you take with your device will be in the OneDrive Camera roll folder. You don't have to upload them to OneDrive manually. Note: Camera Upload can only be used on one account at a time. In the OneDrive app, tap the Me icon at the bottom of the app, then tap Settings . Make sure you're signed in to the app with the account that you want to upload photos to. Confirm again that you have the right account selected. Select the appropriate flash setting (on, off, automatic, or torch) by tapping the Flash icon in the upper right corner. Select either Whiteboard, Document, Business Card, or Photo, then tap the white circle icon to scan the item. Tip: Office 365 subscribers have the option for multi-page scanning, allowing you to combine multiple scans into a single PDF. To utilize that option, tap Add, then scan your next document. Once you're done editing your item, tap Done, enter a file name, then tap Save. Tip: Files are automatically saved as PDFs. You can search for text within files and even photos. To search for text in a file or photo, tap Search in the top bar, type the phrase you want in the Search box, and then tap the search icon at the bottom of the screen. You can add folders in the Files view, or within other folders in OneDrive. In the view or folder where you want a new folder, tap Add at the bottom of the screen, and then tap Create folder. Type in a name for the folder, then tap OK. Select the files you want to move, and then tap Move (You may have to tap More first to see the Move icon). Tip: You can move folders into another folder, as well as individual files. Your Files list appears. Tap the folder you want the files moved to, then tap Move here. Tip: To create a new folder for these moved files, at the bottom of the Files list, tap New folder. Enter a name for the new folder, then tap Create. 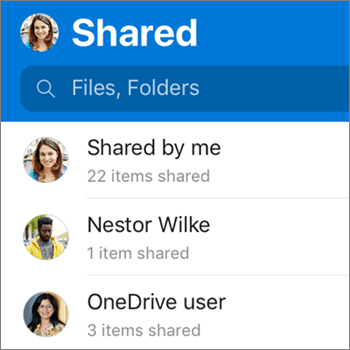 If you're using OneDrive, you can access your SharePoint files in the mobile app without leaving OneDrive. SharePoint sites you've recently interacted with or that you follow appear in a list located under the name of your organization. You'll also be able to see your Office 365 groups in the list, as each group will have its own team site. To learn more, see Find your SharePoint files in OneDrive. In the OneDrive app, open the folder you want to sort, and then tap the arrow next to the current sort order, for example Sort by name (A-Z). Pick how you want the files sorted. You can sort by name, date, size, or extension. Files deleted from OneDrive are kept in the OneDrive Recycle Bin for 30 days for personal accounts. The files can be restored to OneDrive before then, or you can permanently delete them from your OneDrive. Tap the Me icon in the bottom right of the screen, then tap Recycle Bin. In the Recycle Bin view, select the files you want to restore. To restore the files back to your OneDrive, tap Restore . Note: If your recycle bin is full, the oldest items will be automatically deleted after three days. If you're signed in with a work or school account, items in the recycle bin are automatically deleted after 93 days, unless the administrator has changed the setting. See more information about how long deleted items are kept for work or school accounts. In the Recycle Bin view, select the files you want to delete. Tap Delete to remove the files permanently. (Alternately, if you want to empty the entire Recycle Bin at once, tap Delete All. Tap More next to the file you want to save and then tap Save. You can also select multiple files by pressing and holding one photo or video, then tapping the circle next to additional file names to check them. Tap More in the upper right corner, then tap Save. You can share files, photos, and folders from the OneDrive app for Android, just as you can on a PC or Mac. To stop sharing, go to the OneDrive website and sign in with your Microsoft account, or with your work or school account. When someone shares a OneDrive file or folder with you, you typically get an email message or a notification on your Android device. To find the files shared with you in the OneDrive app, tap the Shared view icon at the bottom of the app. The Shared view includes files shared with you, and files you've shared with others. When signed in with a personal OneDrive account, tap a sharer's name to find the files shared by that person. Note: The Shared view looks different when you're signed in with a work or school account. Mark files or folders "offline" to read them anytime, even when you aren't connected to the Internet. Online edits made to the files sync the next time your Android device connects to the Web, so you get the latest version of the file. Files or folders marked offline are read-only - you can edit them only when you're online. If you edit a file offline, it saves as a new file, and does not change the original OneDrive file. Taking folders offline is available for Premium OneDrive with an Office 365 subscription. In the OneDrive app, tap and hold the file or folder that you want available for offline reading, then tap Keep offline at the top of the app. Files or folders marked for offline reading have the Keep offline icon in the List view. Tap the file listing anytime to open the file for reading. Tip: Once you mark a file or folder offline, OneDrive also lists it in an Files Available Offline view. Tap the Me icon at the bottom of the app, tap Files Available Offline to instantly find all your offline files and folders. To stop keeping a file or folder offline, select the offline file or folder and tap Online only . Here's how to set a ringtone from a OneDrive music file. From any Home screen on your device, tap ﻿Apps > Settings > Sounds and Notifications > Ringtone. To use your own music file, scroll all the way to the bottom, then select Add ringtone. Tap Complete action using: OneDrive, then tap Just once, if prompted. Note: If you don't see the OneDrive option, download and save the music file to your device first. Select ﻿the music file, and then tap Done. If you want to set a ringtone from your device rather than from OneDrive, you may have to clear the OneDrive app defaults. Go into Settings > Apps. Scroll down and then tap OneDrive. After you clear the OneDrive defaults, you should be able to use the Sound Picker whenever you choose OneDrive files as ringtones, instead of going to OneDrive. Scroll down and then tap Clear Defaults, and you're done. In the OneDrive app, tap the Me icon at the bottom of the app. You'll see your total storage and space available near the top of the Me view. OneDrive can remove local copies of the photos on your device to free up some space on your phone for things like apps and music. Clean Up Space will run automatically once you have at least 1 GB of photos or videos to upload on your device (either by already having them on the device or by taking new ones). A notification will appear on your device offering to Clean up space on your device. Tap Yes under the notification to free up the space on your device. Tap Camera upload and set Camera upload to On. Tap Clear space on your device. You can add a passcode to help prevent other people who use your device from accidentally accessing, changing, or deleting your files. In the OneDrive app, tap the Me icon at the bottom of the app, and then open Settings. Tap Passcode, and then turn on Require code. Enter a 4-digit code, and then enter it again to verify it. 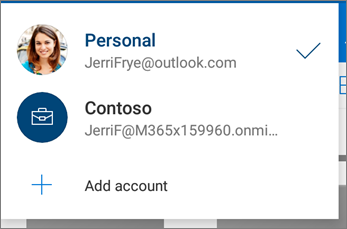 To sign out of a personal OneDrive account or a OneDrive for Business account, open the app, tap the Me icon at the bottom of the app, then tap Sign out. Open the Google Play Store, access the menu in the upper left, and select My apps and games. If you still have problems with the app, try deleting it and then going to the Google Play Store to download it again. If you don't see a file you're looking for in the app, see Find lost or missing files in OneDrive. 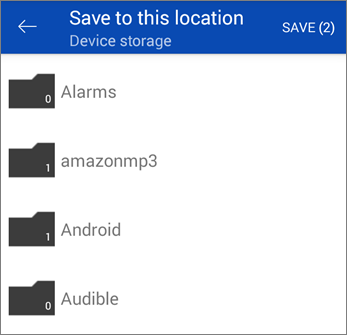 For more help, read how to Troubleshoot OneDrive for Android app problems. You can rate the OneDrive app when you view it on an Android device, or get help, by shaking your device.